Reliable roofing installations and materials are vital to both commercial and residential applications in Pittsburgh, Monroeville, Stamford and Norwalk. They need to provide lasting protection against leaks, damage to the structure, and temperature control. There are two generic classifications of flat roof types and materials used for the installation and repair of them: low pitch and flat. When installing or repairing either type of roof there are three types of synthetic rubber from which to choose to protect against extreme weather and water impermeability. 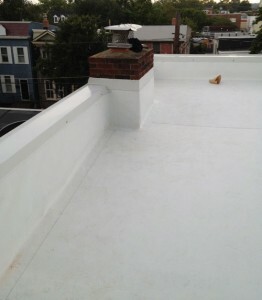 The materials used can be categorized into three types which are synthetic rubber: Thermoplastic Polyolefin (TPO), Polyvinyl Chloride (PVC), and Modified Bitumen which is a 2-ply roofing system. There are several markets for these type of materials. In the US roofing market, a single-ply roofing system is dominant. Most popular are TPO and PVC membrane roofing systems. In 1991 Flexible Polyolefin (FPO) membranes were first introduced in Europe. The average membrane consisted of a 0.064 inches (1.6 mm [63 mils]) in thickness. The United States quickly introduced the U.S.-produced TPO membranes and gained a steady market share in the roofing industry because of its economical price. The most common TPO thickness used in the U.S. is 45 mils. and many of the products labeled “45 mils” actually have as little as 32 mils of actual polymer3. European manufacturers also use a fiberglass and polyester to reinforce the membrane, but a U.S. produced TPO reinforced membranes will expand and contract 5 to 7 times more. TPO membranes also need the proper cleaning solvents that must be used in the installation process to achieve consistent seaming. The properties and chemical formulations that lead to the membrane’s deterioration and failures are due to the choosing of the membrane’s thickness, and the reinforcement used. TPO cannot withstand the temperature swings that occur in much of North America. Nevertheless, TPO manufacturers in the US are looking forward to creating an improved formulation that would have the advantages of PVC without risking its marketable price tag. Polyvinyl chloride (PVC) has been in the U.S. roofing market since 1970 and continues to hold its reputation in relation to durability and quality performance. It has a flame retardant property with an exceptional chemical resistance and lower stress cracking issues. However, history reveals that PVC underwent the same downfalls that TPO did during its early stages in the U.S. roofing market. This led to the questioning of U.S. manufacturer’s reliability in comparison to its European counterpart. Evidence showed that TPO and PVC demonstrated top performance in Europe, but failed in US during its entry in the market due to its inability to withstand the temperature swings that occur in much of North America. Hence, the conclusion was made that U.S. manufacturers prioritized profit over the quality. The exact specifications were sacrificed resulting in production of poor quality versions of both membranes. In view of this fact, the National Roofing Contractor’s Association’s (NRCA’s) research showed that U.S. versions of PVC membrane were thinner than what were produced by its European counterparts. The huge difference was clear as dimensions showed 30-40 mils vs. 60 mils. Furthermore, the formulation and installation were far from the truth because such things were not done in Europe. Slammed by the press, US manufacturers began to look for exact adjustments to the membrane’s formulation. Finally, PVC earns a reputation as a top performing single-ply roofing product in US roofing industry. Because TPO and PVC membranes are single-ply roofing systems, they will give provide a 15 year performance, at best, with numerous maintenance issues. Most repairs will come from workmanship and maintenance people that inadvertently step on nails or screws lying around while working on rooftop units. It is a very costly investment to make for a roof that will not last beyond 15 years and will almost certainly need repairs. It is very easy and safe to attach these membranes to any metal flashing no matter how dirty, bent, punctured or uneven they are. The Modified Adhesives by Karnak makes it very simple and leak proof. These membranes have a very bad reputation for not adhering to metal. TPO has a special flashing system that is manufactured in a factory prior to installation. EPDM – the metal has to be extremely clean and very smooth for it to work. Then a contact adhesive is used to glue it to the metal. Lately they use a self adhering tape to tie it to the flashing. When a single-ply membrane is installed the maintenance is almost immediately necessary. Seams come loose, there are flashing issues and after 10 to 15 years the membrane shrinks and causes other issues.